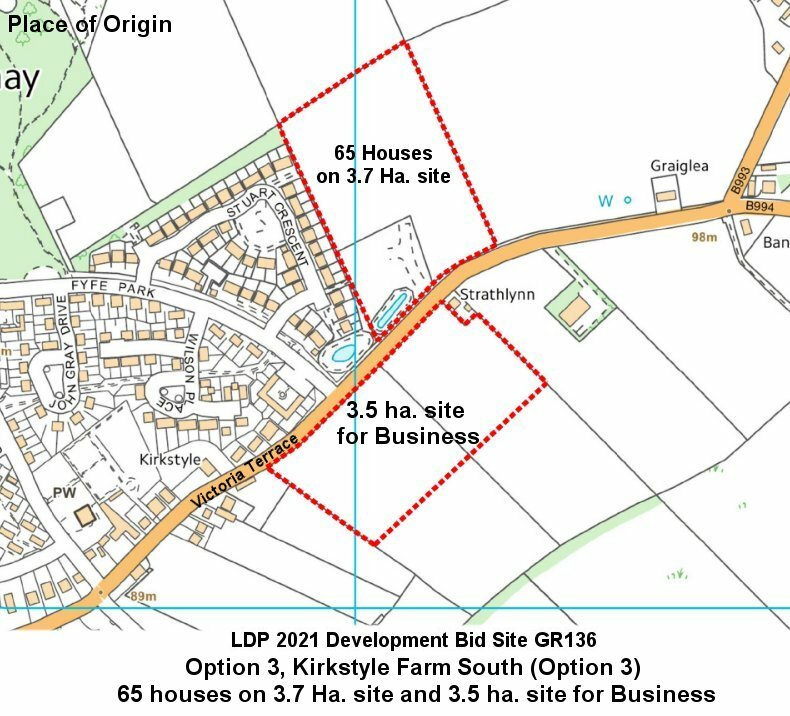 Bid for 65 houses on 3.7 ha. site presently reserved in current Local Development Plan for Business development. The site is located within the Bennachie Special Landscape Area. Applicant indicates that the development proposal site is not at risk of flooding and development would not result in any additional flood risk elsewhere. Water / Drainage: No consultations with Scottish Water yet. At this stage a SUDS drainage solution for the site has not yet been fixed. No reference is made to the historic and recent flooding in Victoria Terrace, which has acknowledged inadequate surface water infrastructure. No reference has been made to the fact that SEPA, with the support of Aberdeenshire Council, have proposed Kemnay as a new Potentially Vulnerable Area (PVA), for flooding. The applicant states that there has been no take up of employment land within Kemnay over a five year period despite there being no overarching development constraints and suggests that there is very little demand for business land in Kemnay and that there is an over provision of employment land in Kemnay. It is maintained that this is due to availability of allocated employment land in nearby major employment hubs along the A96 corridor. Community engagement: As part of the LDP process, the applicant and design team will engage with the community, which is anticipated to commence during the consultation on the Main Issues Report and would be happy to work with Aberdeenshire Council on any engagement exercises that they are carrying out. 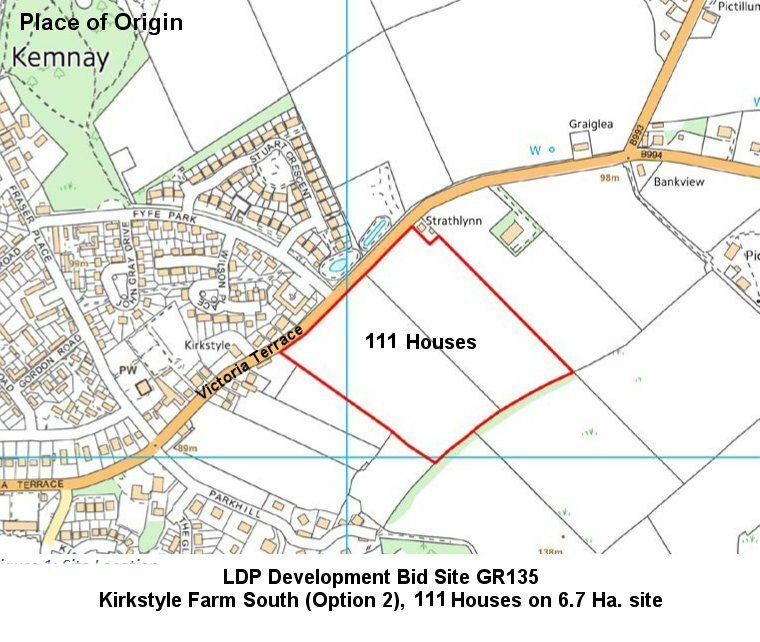 Bid for 111 houses on a 6.7 Ha. site. The site is remote, detached and not conterminous to the existing settlement boundary. 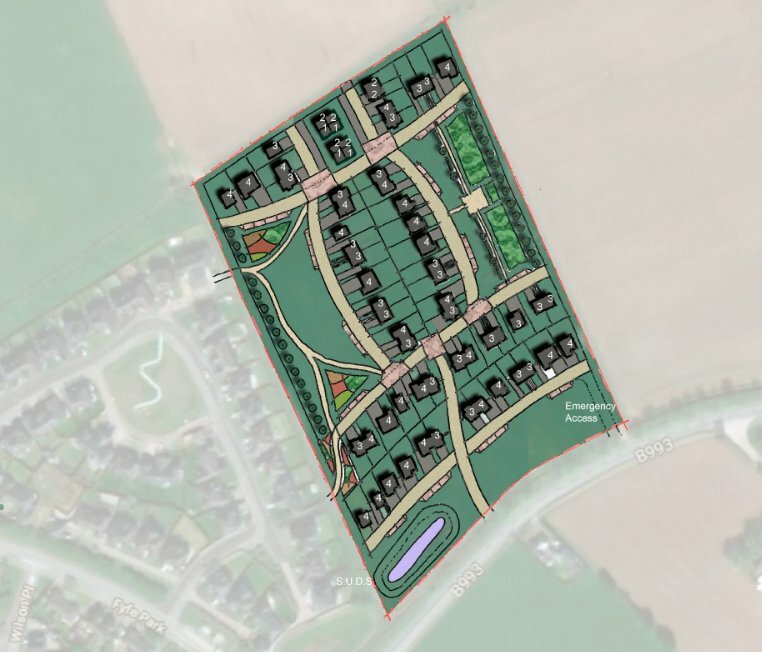 The site rises steeply to the south and any development would be prominent in the landscape and have significant visual impact when entering the village from the east or from the Inverurie direction. The site is not within the Bennachie Special Landscape Area but is on the immediate southern boundary of such and due to the topography of the site it will nevertheless have a negative visual impact, especially when viewed from Place Of Origin.. 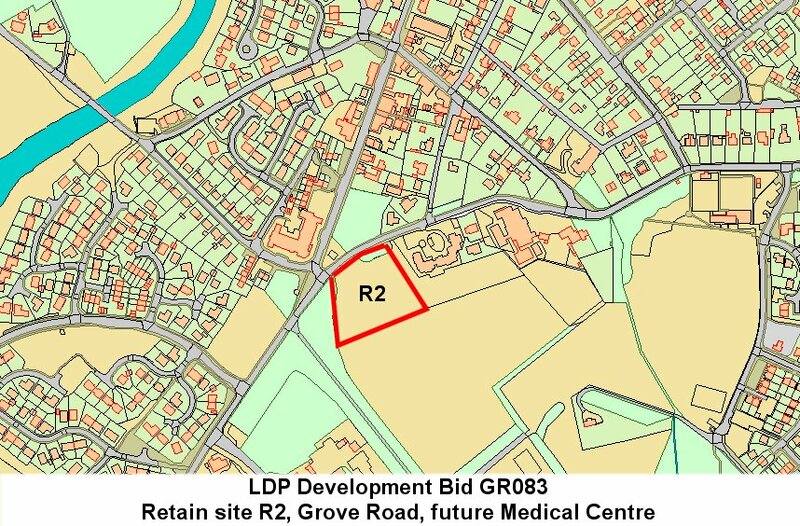 The applicant indicates that the development proposal site is not at risk of flooding and development would not result in any additional flood risk elsewhere. Water / Drainage: No consultations with Scottish Water yet. At this stage a SUDS drainage solution for the site has not yet been fixed. The development will incorporate a sufficient SUDS scheme to ensure that there will be no increase in the risk of flooding at the site or surrounding areas as a result of the development. No reference is made to the historic and recent flooding in Victoria Terrace, which has acknowledged inadequate surface water infrastructure. No reference has been made to the fact that SEPA, with the support of Aberdeenshire Council, have proposed Kemnay as a new Potentially Vulnerable Area (PVA), for flooding. 65 houses on 3.7 Ha. 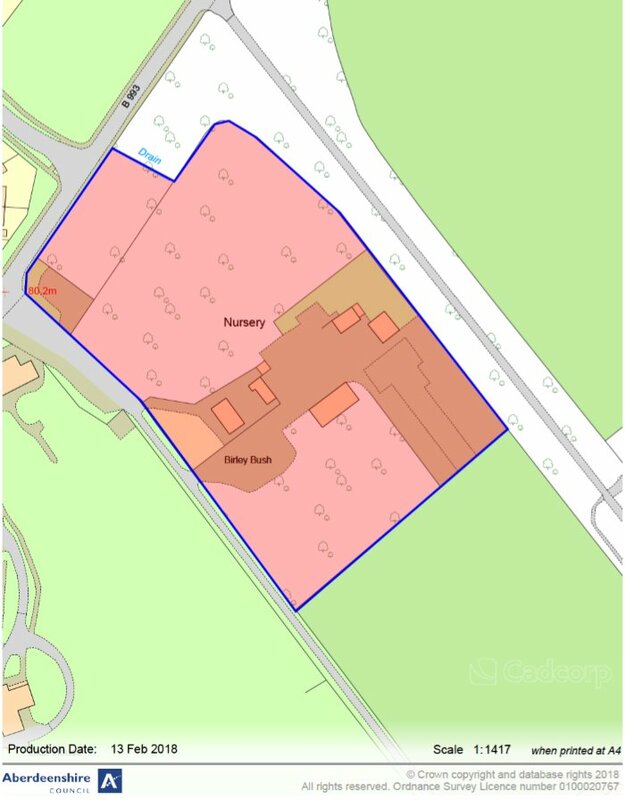 site north of Victoria Terrace presently reserved in current Local Development Plan for Business development plus a 3.5 ha. site south of Victoria Terrace for Business development. The northern sector of the site, which is proposed for housing, lies within the Bennachie Special Landscape Area. The applicant states that the southern section of the site that is proposed for business use is situated immediately east of the settlement boundary for Kemnay, which is misleading because the site is not conterminous with the eastern settlement boundary but remote and detached by a considerable distance. 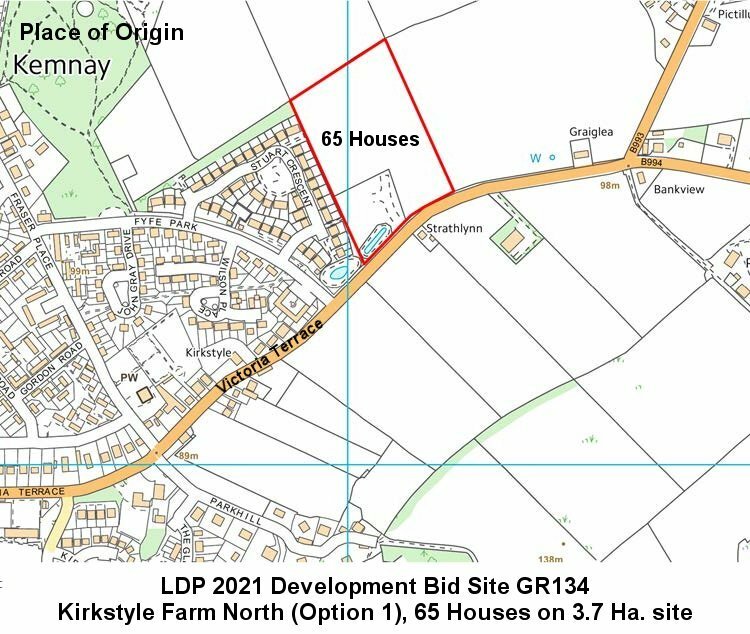 In Bid GR134 Option 1, the applicant made a case for there being no demand for Business land in Kemnay, however, with this option 3, it is stated that notwithstanding the subdued demand for employment/business land in Kemnay, this bid option would maintain the current overprovision of allocated business land in Kemnay, whilst also providing new allocated housing land. 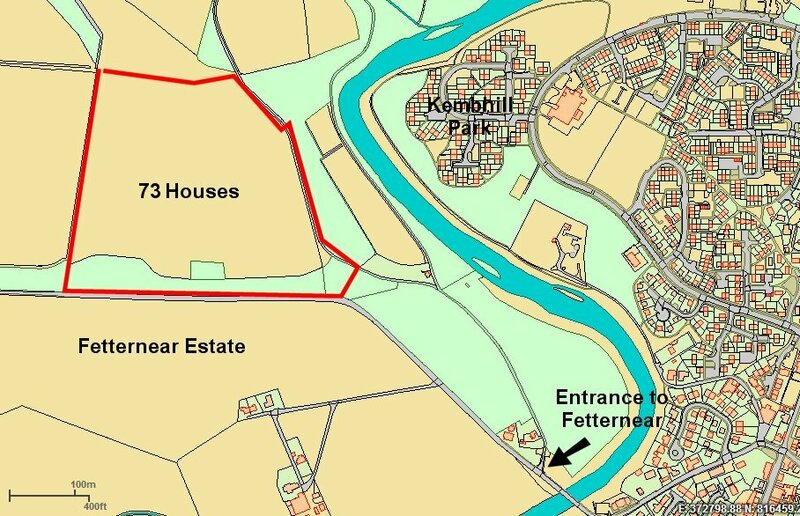 73 houses on 12.3 hectare site at Longdykes, Fetternear Estate, opposite side of River Don from Kembhill Park. Bid submission form states 73 houses but the layout indicates 56 houses? Applicant states that the development proposal site is not at risk of flooding and development would not result in any additional flood risk elsewhere. Community engagement: applicant states that a visit to Kemnay Community Council is planned for late spring or early summer 2018. 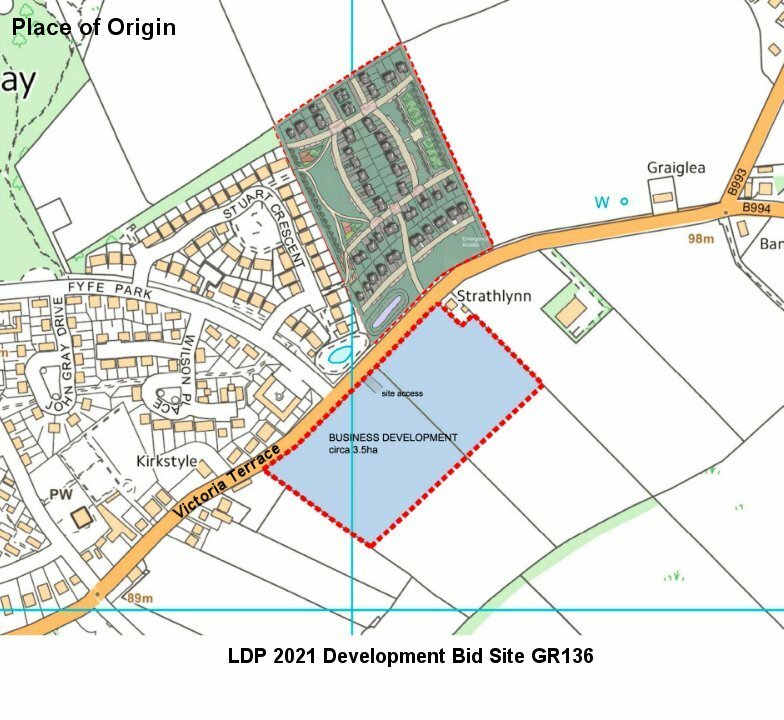 Aberdeenshire Council Local Development Plan team will now assess development bids to ensure that when sites are identified in the Main Issues Report there is a robust argument to justify them. 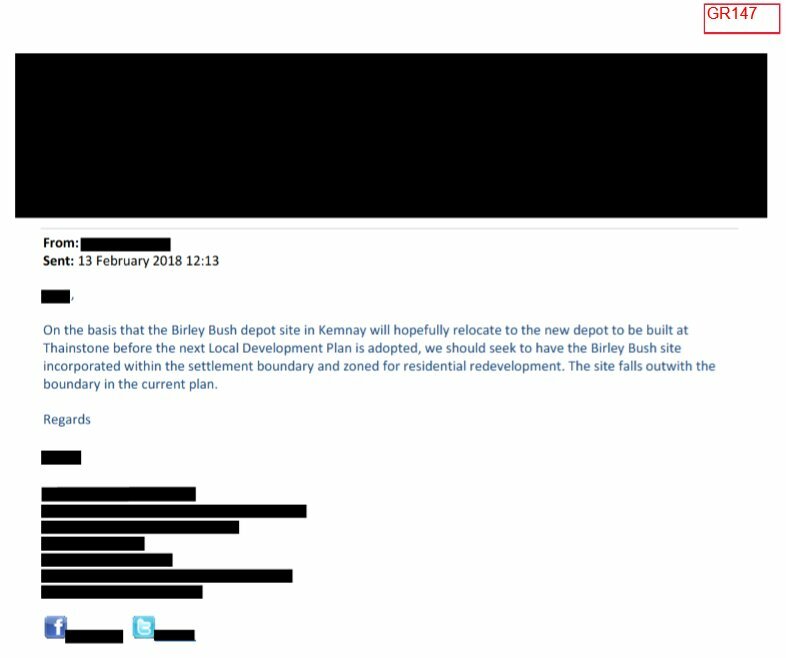 The conclusions from this assessment include consideration of deliverability of the sites, known constraints (if any), impacts identified by the Strategic Environmental Assessment process, and a draft recommendation as to whether the site should be favoured in the draft proposed Local Development Plan (LDP) and Main Issues Report (MIR), or not. Matters raised will be further explored by the Policy Team with outcomes included as part of the MIR and draft Proposed LDP expected in November / December 2018. Aberdeenshire Council adopted the last Local Development Plan on 17 April 2017. Formation and Completion of a Local Development Plan (LDP) can take anything up to 5 years. Failing to meet this timescale means that there is risk that the plan is deemed “out of date” and controls on planning applications are relaxed. The Scottish Government is currently thinking about a major review of the land use planning system. There is very little information as to what may be included in the Government Bill, for consideration by the Scottish Parliament, or of the secondary legislation that is likely to follow. 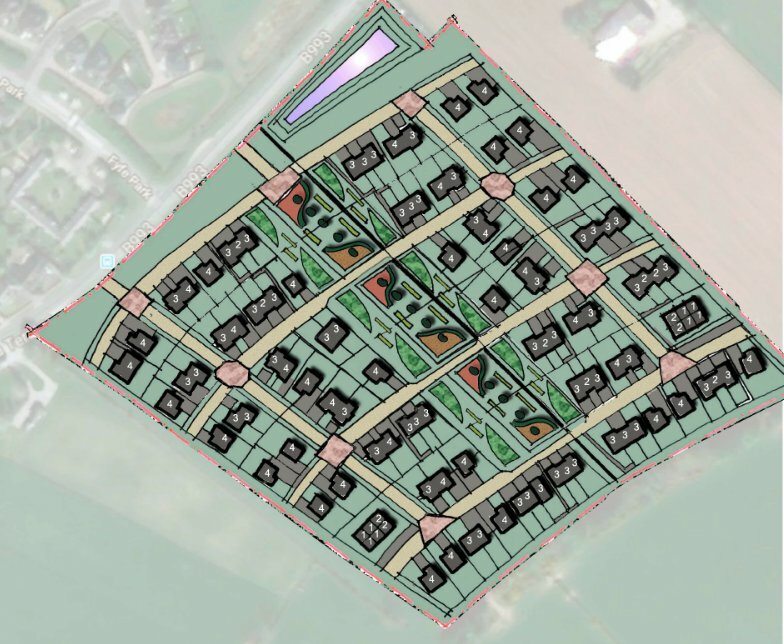 As such we are proceeding with the preparation of a land use plan that will provide useful information about “places” that could be taken forward into a different planning system, or into the community planning arena. 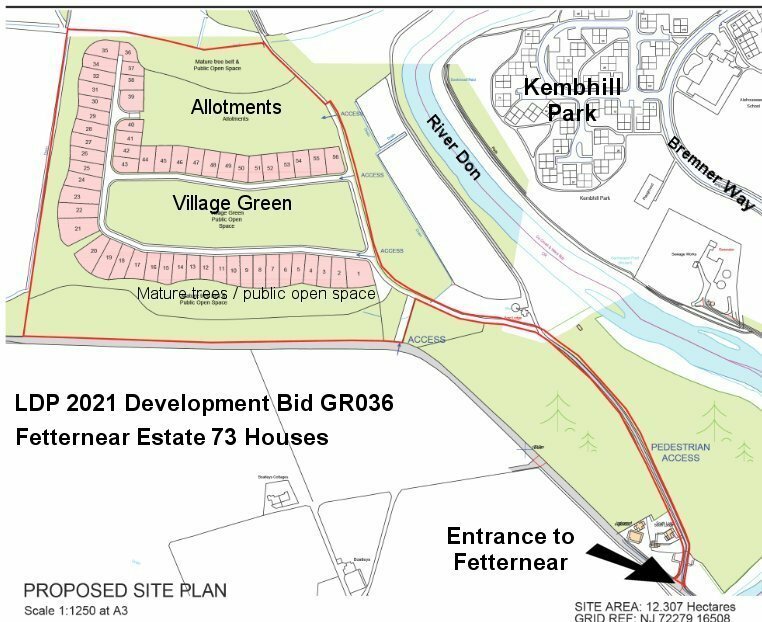 Representative/s from Kemnay Community Council will be invited to attend a meeting on 12-13 June 2018 at Aberdeenshire Council, Gordon House, Inverurie, to discuss the bids proposals for Kemnay. 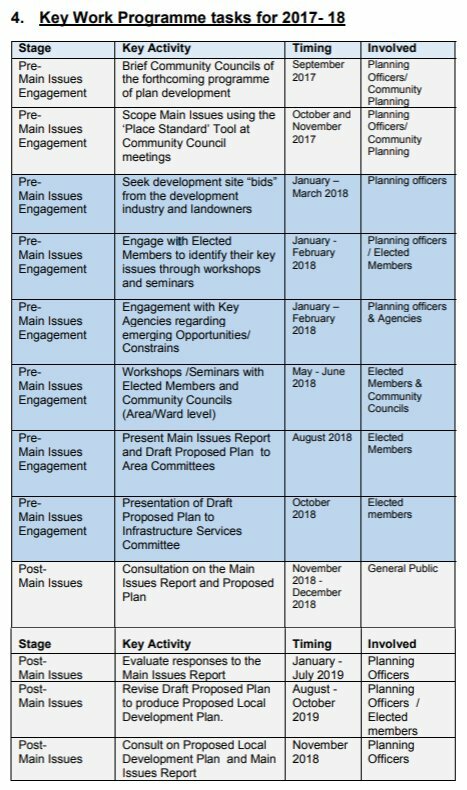 The next stages are shown in the programme below, a draft LDP will be published (probably November 2018), along with the Main Issues Report (MIR) and comment invited from general public and Community Councils in November-December 2018.